Summer is here and our next meeting is not until September, but we wanted to thank everyone for a successful first half of the year. We had volunteer events to remove invasive English Ivy at the park, cleanup along Indian River Road, and garden at the Indian River Oaklette Bridge. Over 110 volunteers came out for Clean the Bay Day at Indian River Park and Plymouth Community Park collecting over 1500 lbs of trash. And our BioBlitz was a big success documenting over 300 species of plants and animals in the park, 121 of which were recording on the day of the event. Three of our members have now worked with the Elizabeth River Project to install oyster reefs off their property on the Indian River. Over 180 cubic yards of oyster shell were strategically placed to provide the foundation to accelerate the recovery of oysters in the river. The reefs will also provide homes to other river life including blue crabs, mussels, snails and juvenile fish. At this point several other waterfront property owners have approached us to learn how they too can participate in river restoration efforts, like oyster reefs, living shorelines, and rain gardens. If you are interested, reply back to this e-mail. Our next regular meeting will be Thursday, September 15, 7 pm at Oaklette United Methodist Church. Jim Cahoon of Bay Environmental will present on Living Shorelines and Rain Gardens. We'll also have information from the Elizabeth River Project on how you can get help in doing your own living shoreline or rain garden installation. Would you like to have a healthier, river-friendly lawn? 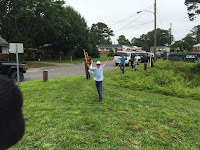 The non-profit Elizabeth River Project can help you plan your organic lawn makeover and provide up to $500 in funding. One of their lawn expert will schedule a time to meet with you to go your over lawn concerns and goals and conduct a soil test to see what your soil needs. Often in this area, aeration, to deal with compacted soils, and top-dressing with organic leaf compost will add beneficial microbes to the soil. And, they can provide up to $500 to help Chesapeake homes in our Elizabeth River watershed with these lawn makeovers that are not only river-friendly, but safe for pets and kids as well. Sign up to have our lawn expert contact you at http://www.elizabethriver.org/organic-lawn-care-makeovers or call 757-399-7487. 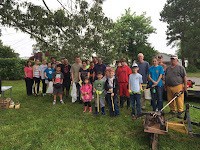 This year the Friends of Indian River hosted cleanups at two sites - our 4th year at Indian River Park and, for the first time, Plymouth Community Park on the west shore of the Indian River. At Indian River Park, 81 volunteers pull about 530 pounds of litter. We thank all the volunteers who came out including Cub Scout Packs 42 and 700 and Boy Scout Troop 303. This year we expanded efforts into new areas south of the power lines that we didn't reach previously. And, we're very happy to report that the total trash collected was 40% less than last year haul and only half of the 1000+ pounds we collected in 2014 - a really positive trend. 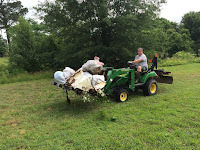 This was our first year at Plymouth Community Park and perhaps the first cleanup at this site by anyone in a really long time. Plymouth Community Park is a small 4.5 acre park wedged between the Plymouth Park and Campostella Square neighborhoods along the river. The park consists primarily of a riparian buffer along the river and a stream, an open field, and has no amenities. About 30 volunteers came out and collected over a 1000 pounds of trash including 13 tires and items like an old microwave. We had to bring in a small tractor to help haul some of the stuff out. A big thank you to the volunteers at this site and our first time Zone Captain Carol. We hope to see increased community involvement and stewardship at this site and are planning to return for the International Coastal Cleanup in September.